An implant-supported denture is a type of overdenture that is supported by and attached to implants. An implant-supported denture is used when a person doesn't have any teeth in the lower jaw, but has enough bone in the jaw to support implants. 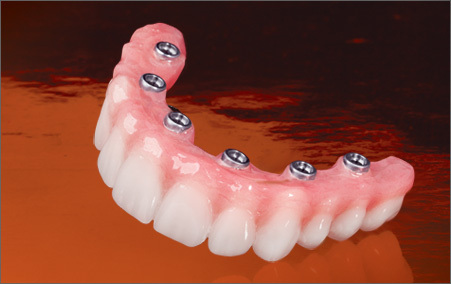 An implant-supported denture has special attachments that snap onto attachments on the implants. You should remove an implant-supported denture daily to clean the denture and gum area. Just as with regular dentures, you should not sleep with the implant-supported dentures at night. Implant supported dentures consist of a denture that attaches to four dental implants. The implant supported dentures option is heavily advertised as an “All-on-4”, yet there can be more implants. In addition to all on 4. This consists of 4 or more dental implants and a removable prosthesis that attaches in some manner to the dental implants. There may be a metal bar to support the denture. Two surgeries usually are needed. The first one places the implants in the jawbone under your gums. The second surgery exposes the tops of the implants. The second procedure comes three to six months after the first. A one-stage procedure is now used sometimes. In this procedure, your dentist can place the implants and the supporting bar in one step. The success rate of this procedure is high. you could not eat before. However, you will not be able to chew hard or sticky foods because they can damage the denture. An implant supported denture is a very good option. 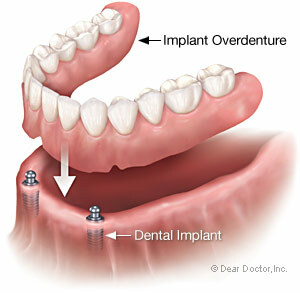 Implant supported dentures are fixed, meaning they stay in at all times. These are basically a type of dental bridge that uses dental implants to replace missing teeth. The hybrid denture also works to replace or fix the gums and loss of bone around the lost teeth.Several dental implants are placed in the jaw bone and the bridge is glued or screwed into place. The result is a new set of teeth that are cosmetic and strong and allow a person the use and enjoyment of real teeth. A fixed detachable (hybrid) denture is secured to the implants and is only removable by the dentist. Unlike ordinary dentures you don’t need to take them out every night for cleaning as they are hygienically constructed to enable you to clean underneath, but you will need to return to us a couple of times a year to have the denture unscrewed and professionally cleaned. They can be made less bulky than traditional or even “snap-in” dentures.